It can be challenging to plan social media content that coordinates with important dates each month. That’s why we’re excited to present a great new feature for your social content planning: GAIN’s calendar labels. This feature will help you add and remember important dates in each of your social channel calendars and quickly view all labels at a glance on each of your client calendars. Calendar labels can span multiple days or weeks, can be color-coded, and you can create as many as you like. Clients and approvers will also see these labels when they visit the calendar so you can keep them up to date with your content planning efforts. Click “Add Calendar Label” located at the top of each client calendar to get started! Name your calendar label, define the date range, choose a color for your label, and include a description (optional). Your new calendar label will instantly appear on your client calendar. Now that you know just how easy it is to create calendar labels, here are a few productive ways to start using calendar labels to track important dates, events, and promotions. The best way to come up with fresh content ideas is to truly listen to your audience and what they need. What problems or challenges are they facing? How can you help? As marketers and brand managers, we are constantly analyzing social media, asking them questions, reading blog comments, and reviewing support tickets. All of this audience feedback can be organized in a way that provides you with endless content ideas for social media posts. However, sharing content that tells a story and makes sense as a whole can be challenging. GAIN calendar labels can help you plan and create content around these ideas. For example, you can label each week with a different problem you want to help your audience solve, and build your content around weekly or monthly themes. 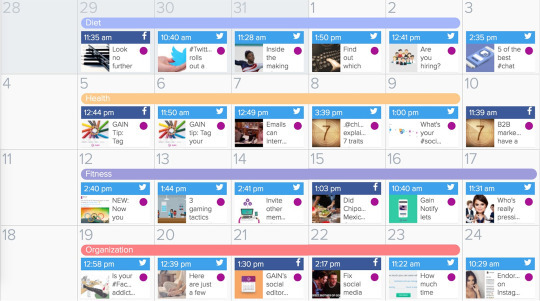 GAIN’s calendar labels can help you coordinate multiple social campaigns easily. Planning an entire month of social media content that includes unique monthly campaigns or promotions can be time-consuming, especially if you’re managing multiple accounts. To help you organize your posts in advance and help cut down on time, GAIN’s calendar labels can help you view exactly how much content you’ll need for each day or week at a glance. They can also be color-coded, so you can distinguish between different promotions if you’re running multiple campaigns at a time for one client. The beginning of a new year is the perfect time to label in advance all of the traditional themes and holidays that might be possible opportunities to promote your product or service each month. Here’s a list of some of the most traditional marketing opportunities, so you can get a jumpstart on labeling your GAIN calendars and prepare your content accordingly. 4. Customize calendar labels any way you need! These are just a few of the ways you can start using GAIN’s calendar labels to work more efficiently, but it’s definitely not all of the ways. There’s no single solution for every brand; that’s why GAIN gives you ultimate flexibility on how calendar labels can be used. From labeling simple reminders to weekly blog posts, to labeling holidays and seasonal promotions, you can start labeling your calendars any way you’d like. What is the Current State of The Hashtag?